Intertops Poker is expecting to be extra busy this weekend due to a bonus tournament and a reload bonus being offered until Friday. It's not unusual for this popular poker room to add extra freerolls to its poker tournament schedule but the prize pool is usually $500. Players that deposit between now and Friday will get a ticket to a special $2500 Freeroll tournament to be held on Sunday. Meanwhile, Intertops Poker’s World Cup Leaderboard tournaments continue throughout the games in Brazil. They begin 90 ninety minutes before each World Cup group game and award tickets to a $10,000 GTD to be played next month. 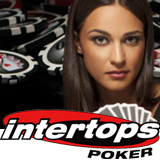 Full tournament details are available under the Promotions tab on the Intertops Poker website.